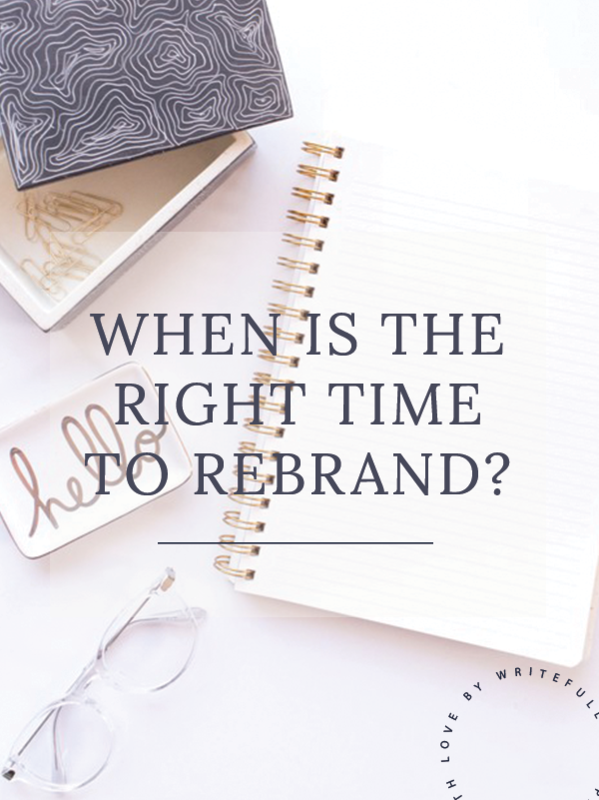 When it comes to figuring out when is the best time for you to rebrand your business, there is no one-size-fits-all answer to this question and is totally dependent on each business. But before you decide when the right time to rebrand your business, let’s quickly talk about what it means to rebrand your business. Rebranding isn’t just about updating your logo design and your website. There is so much more to it. Rebranding means that you are reevaluating all aspects of your business – your mission, ensuring that your products & services still align with your mission, making sure that you have solid internal systems and client experience in place, and of course the aesthetics of your brand. Rebranding helps you to better define why you do what you do, and make sure that it’s represented throughout your entire brand. During this process, you need to take the time to really dig deep and make sure that your brand is working for you and your business, in the best possible way. Your Mission. Reevaluate your mission and vision for your business, and make sure that they are still relevant to your business. Has your business shifted? Are you still loving the niche that you created your business around, or have you noticed that you are shifting your business in another direction? Are you dreaming of all the things in a different industry or towards a different client base? If so, it’s probably time to rebrand so that your brand reflects the niche and ideal clients that you find yourself dreaming of working with. Is your brand consistent? If you are finding there is a disconnect between your website, your social media, the message & work that you are putting out to the world then you need to rethink things. Your brand needs to be professional, cohesive, and consistent across the board and on all levels of communication with your audience, potential clients, and current clients. This includes things from your email signature & communication, your online presence (your website + social media), and your printed collateral. Be sure to use the same colors and fonts, and headshot on your site as you do your Instagram profile, Facebook profile, etc. If you are not consistent, you do not have a solid brand. Is your brand outdated? It is important to keep your brand fresh and up-to-date. You don’t want something that you created 10 years ago, just because you love a certain element, such as a flourish or a font. You can still use a flourish or a similar font in your brand, but I guarantee you that there are much more updated variations that will reflect your brand a lot better than something that you used 5-10 years ago. Another question that usually follows, is “How often should you rebrand?” Ideally, you should keep the same brand for 2-3 years to create consistency and really get your brand ingrained into your audiences’ minds. Being consistent helps your audience remember you, which is honestly half the battle in the first place. Am I right?! However, if your mission or your ideal client changes than you will need to rebrand. It is quite common for your ideal client to evolve as your business grows and your work improves, and as you gain more experience and knowledge in your industry. And when is the best time of the year to rebrand? In my opinion, I LOVE rebranding in the fall so that you can start the new year on solid footing. It’s a great way to make sure that you have all the in’s and out’s of your business on point and ready to take on the new year! BUT you need to consider what is best for you. If you know that spring or summer is your slower season I rebrand then. You want to make sure that you are not rushing through this process, and you have adequate time to really sit down, get your homework done, and focus on what your designer sends your way. I would LOVE, LOVE, LOVE to help you rebrand your business – from the inside out. Set up a free consultation to get to know each other better, see if we are a good fit! Also, please comment below with any questions you may have! What a great post! I think so many people miss the whole picture when thinking about rebranding, and just look at design. It’s just as important to look at how your business has evolved. Absolutely. Rebranding is so much more than just the visuals – it’s making sure that everything is aligned from the inside out. I am in the process of coming up with a rebrand. I want something that goes with my aesthetic more. Thank you for this insightful blog post.